Case in point, my own home in Bend, Oregon, is evolving as more and more of the art I hang on the walls is deeply personal. But because it is deeply personal, it also takes time to discover what I want to welcome into the daily spaces I live in and the most intimate places of my everyday life where I truly relax, unwind, and when I choose to, share my home with others. I can remember when I began renting for the first time during graduate school, my first solo apartment living experience, and I carefully created a collage wall of photographs from my childhood and young adult years, as well as included quotes that inspired me. After all, money was not really mine (financial loans and all), so I didn’t have it to spend, but I wanted to create a home that was mine, and felt personalized as well as a reminder of what I valued and the journey to my present. Over the course of now nearly twenty years, I have framed favorite prints that have spoken to me, as well as purchased prints of art work I had the opportunity to see in its original grandeur in a museum, and when I began working with Inslee Fariss on the illustrations for the blog, I felt a duty and a responsibility to carefully tend to framing each of the original illustrations and creating a space for them in my home. There have been pauses in my discoveries of art for my sanctuary, but when particular photographs are captured or moments are experienced on trips, I am immediately piqued to frame them or welcome something home that speaks to my travels and what my experience meant to me. Which leads me to introducing a talent of an artist I was newly introduced to this summer. 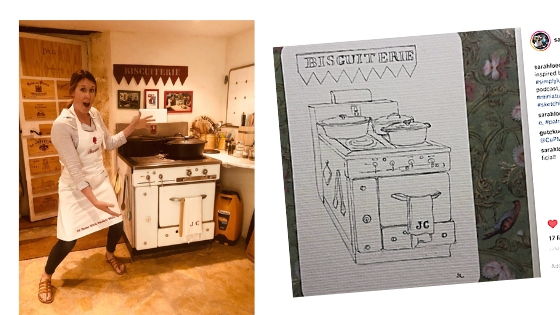 After posting this photo of Julia Child’s stove on Instagram (just below) that I captured during my time in Provence at Patricia Wells’ cooking school this summer, artist Sarah Löcker drew the following inspired drawing. My trip, as TSLL readers know, was one of many memories and it was a true joy to share all that I was able with you on Instagram (be sure to view my highlights as I share detailed videos and pics in a 10-part series) and here on the blog. 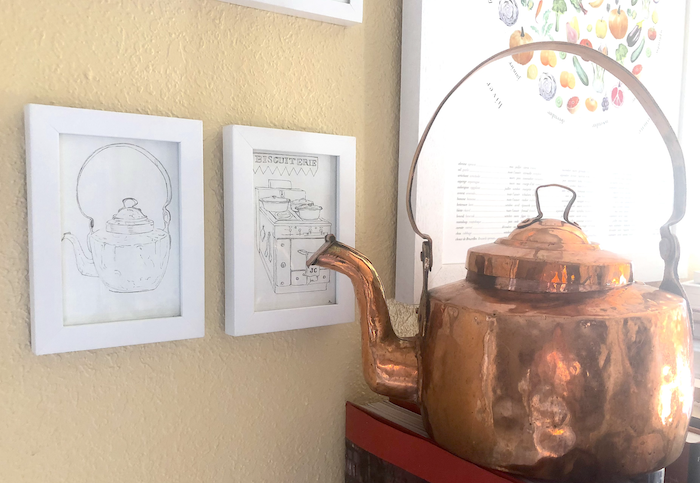 As such, she also drew two additional images inspired by my photographs during my trip: one of my new-to-me and utterly adored copper tea kettle found at a Vaison la Romaine Sunday brocante market and now retinned to its spectacularness and one of Claude Monet‘s kitchen wall in Giverny lined with copper skillets and pans. Sarah Löcker’s drawings spoke to me immediately as they froze in time images that I will forever hold dear to me. During our correspondence, I asked Sarah if I might introduce her and her talents to TSLL readers as I have a feeling some of you may want her to create images inspired by your own photographs and memorable life moments, which she can indeed do for a fair price. Let’s get to know the artist. I was born in Idaho but grew up in Niagara Falls, NY. I studied pre-med at Whitworth University in Spokane, Washington, where I met my husband, Andreas, in my last year. Wanting to start a life together, I reevaluated my plan to become a doctor and instead worked in a medical laboratory for two years in Salt Lake City where I was able to pay off the majority of my student loans and earn a certificate as a laboratory immunologist. When did you move to Austria? In 2004 my husband and I married both in the US and in his hometown in Austria. We moved here [Austria] in January 2005, and have been here ever since. Although I had studied a semester at Oxford University in England, and one in Aix-en-Provence in France, this was my first time living in Europe in the full sense of the word. I am a mother of four children p, ages 7 to 12, who were all born here and dream of going to the US one day. For them it is an almost utopian, Narnia-like place. They are definitely Europeans. 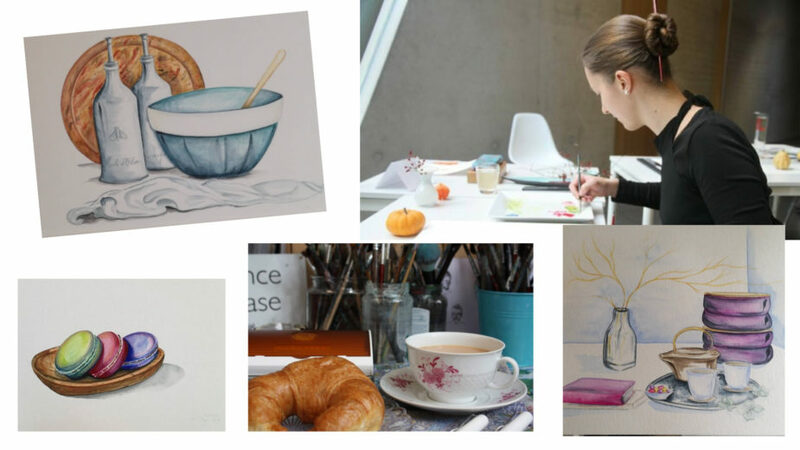 What was your inspiration for drawing and when did you begin? After the birth of my son (the second child), I decided that I would not like to go back to working in a laboratory and decided to try something new. My father is an artist, and so I have been around art most of my life without actually ‘mastering’ anything. I bought a book on painting and began to teach myself. I am a self-taught artist, primarily focused on acrylic landscape painting and illustration. I love the feel of working with ‘real’ paint, but also the presicion of watercolor in illustrations. What is your most memorable and proudest moment as an artist? The project I am most proud of is one I did the summer before last. I drew all of the ‘scientific’ illustrations to be used on signs for a new butterfly hiking trail. I illustrated the life cycle of the swallowtail butterfly as well as plants which are primary food sources for them. These are now printed on the signs along the trail. I contribute to a market stand at the Christmas and Easter markets on the main square of our town. I am currently painting ‘animal portraits’ of some of the exhibit at our local natural history museum, and am in the planning phase of a set of medicinal herbs plates for a book which a local doctor would like to publish. I am also a founding member of ‘Urban Sketchers Graz’ and ‘Koeroesileuchten’ (an annual art stroll in our section of town). 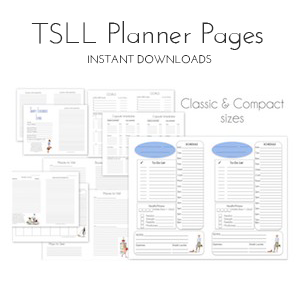 Where can readers find and purchase your work? Virtually all of the art on Instagram(@sarahloeckerart) is for sale. 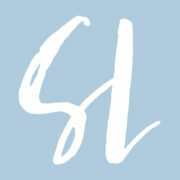 Readers can also visit my blog at https://sarahjloecker.blogspot.com and Facebook . Some of my work is also available via Saatchi Art and Society6. How much can readers expect to pay for an original piece of art? Between 150 – 350 euros for pieces under 40 x 60 cm. I prefer to be contacted directly for sales. I would be willing to offer free shipping for any of your readers/listeners on anything ordered directly through me (up to a value of 40 euros). Do you draw individualized or commission drawings for customers? Not always, but for TSLL readers, yes. 🙂 I always prefer to have at least three photographs of the subject if I am doing a commission. That way if a part of the image of choice is blurry I can look at the detail on another one of the photos. 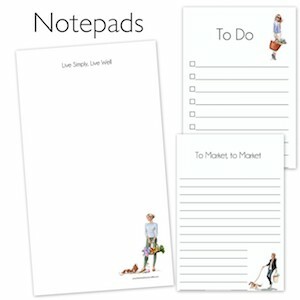 ~Click here to see prices, sizes, and all other ordering information. 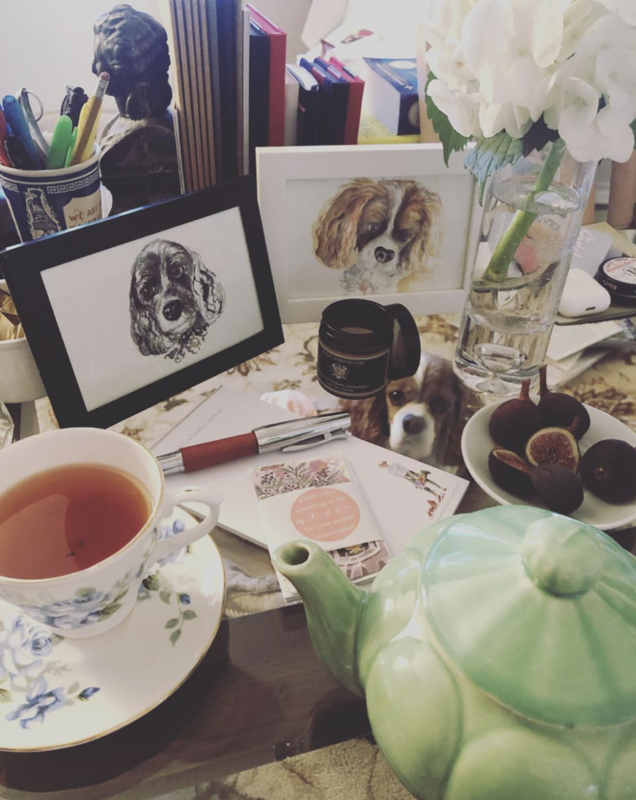 As a gift, Sarah generously painted two additional images for me, both of which you see here – one of my gentleman English cocker spaniel Oscar (left) and one of sweet boy and Cavalier King Charles Norman (also seen in real life in the photo as well). Getting to know Sarah over the past four months has inspired me even more ardently to put more of a signature into my current home. Having moved into my rented cottage just over three years ago, I was hesitant to become too attached to it primarily because I had grown SO attached to my previous home in which I owned and lived for nine years (take a tour here). It was a very difficult decision to let go of my Normandy inspired home in eastern Oregon, so much so I have not gone back to drive by since I left on that last day before moving to Bend in July 2015 (Bastille Day of all days!). And while I did move my previously hung art work into my new home, I have not added much that was new . . . until this summer and now fall. After returning home for what continues to reveal itself to be a life-changing trip (trips actually as the trip to England just last year also opened my eyes even further as well to how indeed I most enjoy living), I have been gradually deciding what I want to place on my walls because as artist Giotto di Bondone reminds, “Every painting is a voyage into a sacred harbour”. And while the Italian artist from the 14th century was talking about the secret harbor of the artist, it is also revealing of the owner of the painting who chooses to welcome it into their living space. I want to thank Sarah for inspiring me, and I have a feeling she will be inspiring many others as well, to bring a bit more luxury into their homes and onto their walls. After all, our journeys are powerful, our journeys are our lives and as something Sarah and I both appreciate – involve the everyday moments. And when we choose to welcome art into our everyday lives, we cannot help but elevate them from ordinary to extraordinary in some small way. Now to the HOW of welcoming art into our homes no matter what our budgets. It is very tempting when you first move into a new living space to fill the walls with anything you can find or afford. Resist. Empty space can also be powerful as well (David Hockney – now the most expensive living painter – commented that he believes it is the empty space in his paintings that people are drawn to, as well as the brilliant colors). Be patient with what you consider, be intentional, and remember your journey has only begun. Purchasing original artwork takes time and an ample budget depending upon who the artist is, but there will be times when a painting speaks to you as you are touring a gallery or an exhibit. I would also advise resisting in these moments as well. Go home, sleep on it, consider why you were drawn to it. What is the significance it will hold in your life? Can you truthfully afford it? And even if you can, ask yourself again, why do you want it? If it is merely to fill wall space, don’t purchase it. Purchase it even if you have to make wall space for it because it is that powerful, significant and memorable. I have thankfully heeded this advice in the past, and it has enabled me to have money eventually to purchase an original piece when I saw something that indeed was deeply significant. A budget friendly idea is to purchase a print of your favorite painting and have it framed. The framing will likely cost more than the print, but if the print again is meaningful to you, it is a rather budget-friendly decor idea. Better still, if you have the opportunity to see the original in person, it speaks to you, you understand its history and what inspired the artist to create it, purchasing the print and framing it is even more worthwhile as you can tell its story to guests you invite into your home and why you chose to hang it on your wall. Once you begin to accumulate multiple pieces of art and wall decor, an idea is to choose selectively what art goes well where. 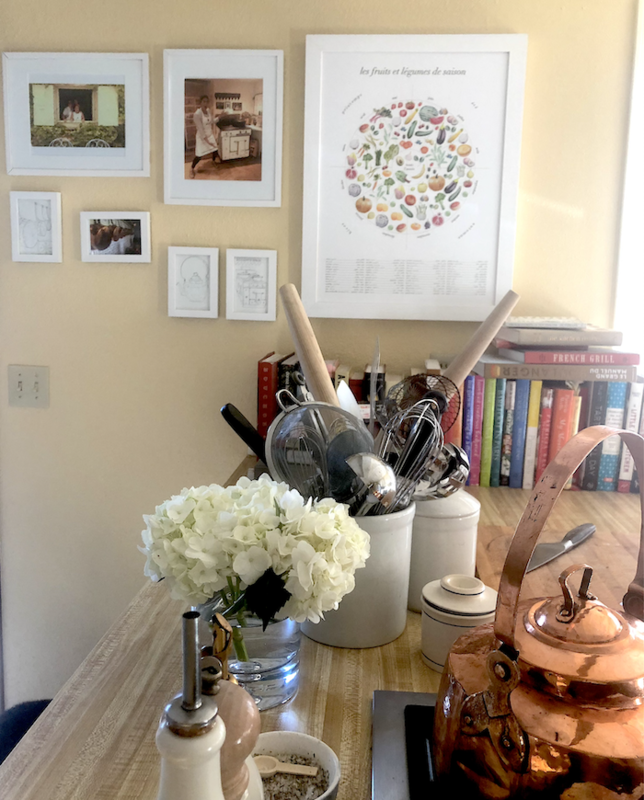 For example, I have chosen to hang my framed photos captured in France and frame illustrations by Sarah Löcker in my kitchen as they are kitchen-themed images. Inslee’s images hold court in my office, and my living room has been reserved for landscape images taken in France (a project I am still working on). 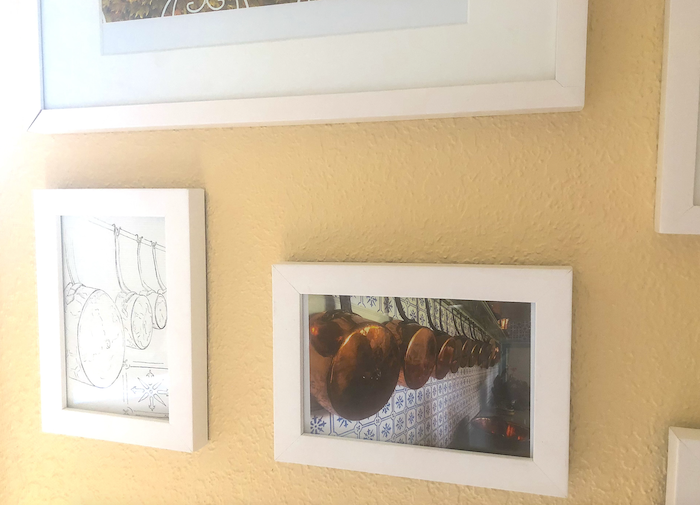 When we are thoughtful about why we choose to hang the art where we do, the conversation deepens, and the story offers multiple layers that can be added to as your own journey continues to unfold. With the high quality of photo capturing on our smart phones, we can now enlarge our photos far bigger than you might imagine. The key is to find a print shop that has the capacity to print the large images and at a fair price. Here in Bend I found just such a shop, and as the printer told me, he can print a photo as wide as 100 inches, it is just a matter of the quality of the photograph. If you have images you wish to welcome into your home and the frame to put on display, know that while you may be spending more on the framing than the printing of the image, it will certainly be an original piece of art. A simple touch to add a professional appearance to your framed pieces of photographs or artwork is to add matting. There are many different styles and colors, but doing so always takes up the quality of the overall piece of work. Another budget-friendly option is to welcome home old art that may no longer have a home. The key again is to scour while you are traveling, hunt while you are enjoying or visiting some place that you love or is special to you. Again, the art you hang in your home needs to be significant to you. Let me explain. While I was living in Northwest Portland more than 15 years ago, the owner of the old apartment building decided to replace the windows. But the windows in my bedroom were gorgeous – leaded-glass, long, narrow – stunning. When the contractors came to replace the windows, I asked if I could have them, and I quickly found out that I wasn’t the only one with a good eye. The contractor had his eye on keeping them as well, and agreed to let me have one and he would keep the other (they were a pair). 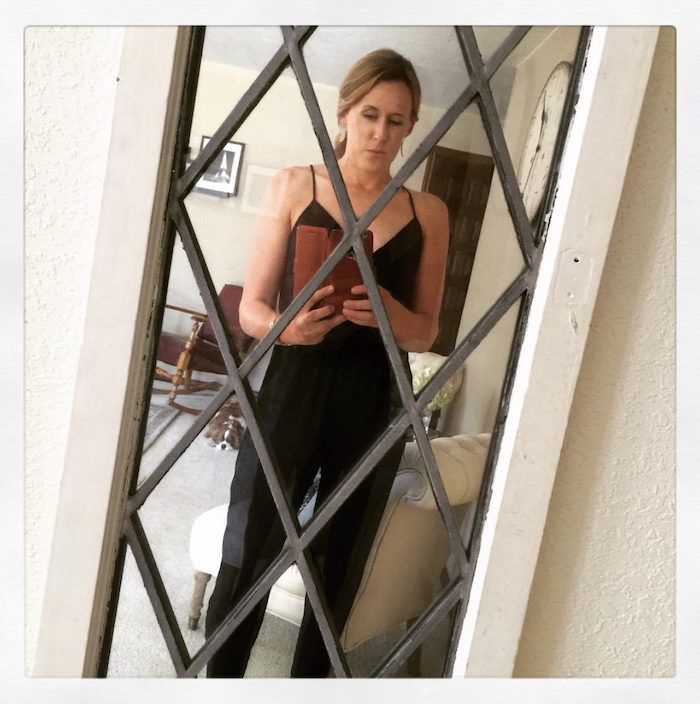 I have had my leaded window with me ever since, and have added a glass mirror behind the panes as it is always hung in my foyer as a quick check of my attire before I leave the house (see an image below). The 18 months I lived in that particular apartment on NW 23rd in Portland, Oregon, is full of memories that I remember fondly, and this item, hung on my wall, keeps them with me. At the very least we are sharing a glimpse of our life’s journey with the world, and the world, our sanctuary, in which we awake, go to sleep, dine, laugh, cry and love begins with us. To bring art into our homes is to add more life to our living space. Auguste Rodin shared, “The main thing [with art] is to be moved, to love, to hope, to tremble, to live.” When we bring art into our home that moves us, that speaks to us, that asks us not to forget, that asks us to continue to dream and aspire, we are living well. We are living simply luxuriously in our own signature way. ~Thank you Sarah Löcker for sharing your talent with TSLL and for inspiring each of us to bring even more luxury into our lives in beautiful, unique and personal ways. I will treasure your illustrations. Lovely article. 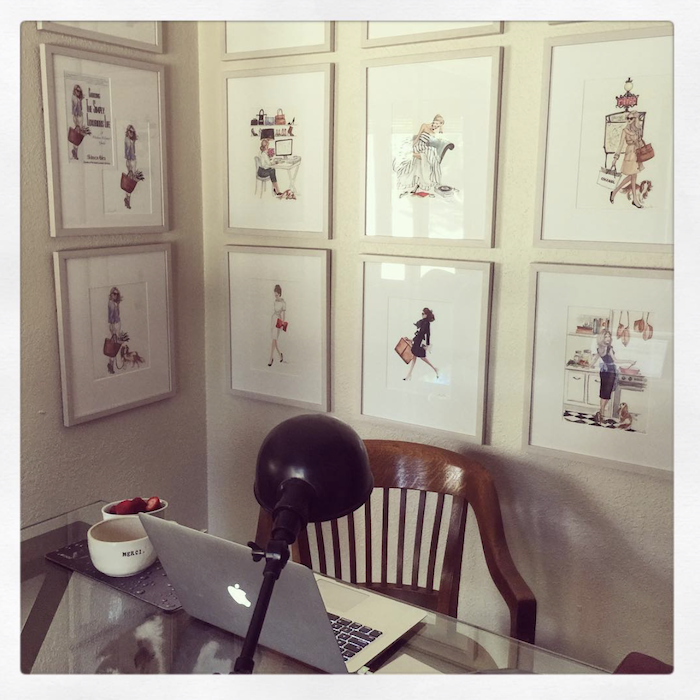 Thanks for the feature:) It was fun seeing how you have framed and hung the drawings. Hello Shannon I am on the same mission and am loving Rebecca Plotnick photography (from the Everyday Parisian blog). Rebecca has many beautiful images for sale which remind me of time spent in France each time I walk into the room where they hang. Friends and family don’t always ‘get’ my long time love of all things French, but as you say, artwork is personal and meaningful to the person choosing to make space for it in their home.